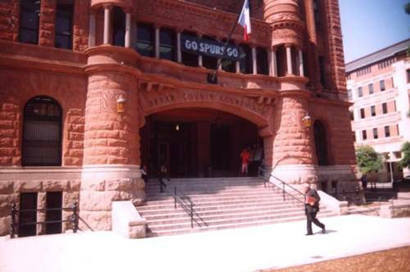 Bexar County Courthouse, San Antonio Texas. San Antonio has had a local government since the first civilians from the Canary Islands settled there in 1731 around what today is the Main Plaza. Meetings were held in the homes of private citizens or in rented or borrowed quarters until the construction of the Casas Reales began in 1742. The Casas Reales (Royal House) was a one-story, adobe building with a dirt floor and a sundial in place of a clock tower and was located on the east side of the Main Plaza. It was completed in 1749, reconstructed in 1779 and reconstructed again in 1783 with an adjoining jail. After Texas gained its independence from Mexico in 1836, Bexar County was officially organized with San Antonio chosen as the county seat. The Casas Reales became the first county courthouse in 1837. This building was the site of many historic events, including the Council House Fight of 1840 where many Comanche Indians were killed during what was supposed to have been a prisoner exchange and treaty signing between Texas and the Comanches. In 1850, five years after Texas statehood, the citizens of San Antonio approved the construction of a second courthouse and jail to be located on the northwest corner of Military Plaza, west of the Main Plaza, where the current City Hall sits. The 1837 courthouse was then used as a public school and eventually demolished. The second Bexar County courthouse, built by Thomas Whitehead, combined the Greek Revival style with that of a Georgian style house. The two-story building had a five-bay front, prominent stringcourse, corner quoins and a hipped roof. The upper floor contained the courtroom while the lower floor held the city offices. The jail, with four cells, was attached to the rear side of the building. When bats took up residence between the building's canvas ceiling and roof, the courthouse became known as the "Bat Cave." Housing both city and county offices, by 1859 the second courthouse was becoming overcrowded, prompting city officials to relocate their offices to the French Building, named for its owner, John C. French. Completed in 1858, the French Building was a massive stone office building, situated off the southeast corner of the Main Plaza, directly east of the 1892-96 courthouse. In 1868, it was designated as the courthouse, although the 1850 building was still being used. In 1872, the courthouse was officially moved again to the Masonic Building on Soledad Street, northeast of the Main Plaza, built ca. 1858. The three-story rock building was purchased by the county with the agreement that they would also pay off the debt and back taxes owed by the Masonic lodge. When the county and the city became separate government entities in 1872, the 1850 courthouse became the property of the city, but the county was still allowed to use the building until a new courthouse was built. 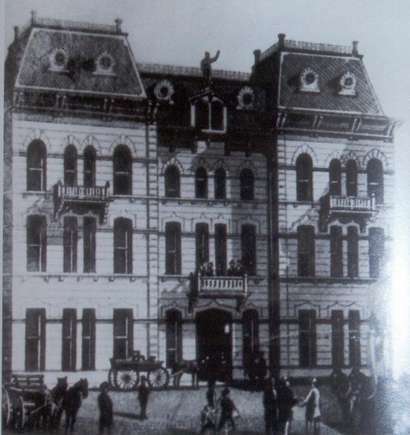 By 1879, the French Building was again being used to house county and city offices as was the Kampmann Building on the northeast corner of the Main Plaza. 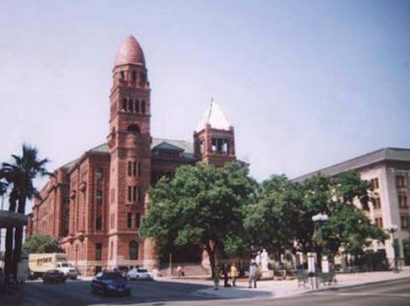 In 1882, it was decided to remodel and expand the Masonic Building, making it the third Bexar County courthouse (although the French Building is sometimes considered the third courthouse.) Selecting plans submitted by well-known San Antonio architect Alfred Giles and hiring D. C. Anderson as the contractor, the building was completed and accepted by county commissioners on April 3, 1883. More than doubling the size of the previous building, the three and a half story 1882 courthouse was built of limestone and designed in the Second Empire style. The courthouse was divided into three equal bays, the central bay being flanked by pavilions with Mansard roofs and bullseye windows. 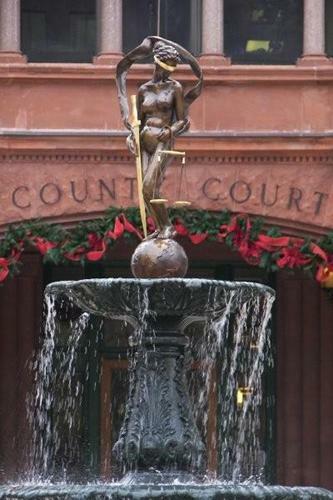 The courthouse also included balconies and cast iron cresting around the roof. Needing even more office space than the new courthouse provided, in 1888 the county commissioners purchased the Meny Building immediately south of the courthouse. Even before the purchase of the Meny Building, structural concerns and space problems in the 1882 courthouse led county officials to start discussions about building a new, larger courthouse in another location. The 1850 courthouse was demolished in 1889 for the building of the City Hall in 1890. The 1882 courthouse, the French Building, the Kampmann Building and the Meny Building were also eventually demolished. 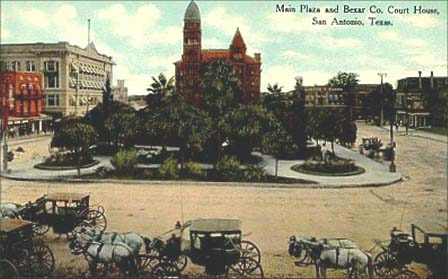 In 1891, property was purchased on the south side of the main plaza for the construction of the fourth county courthouse and a design competition was held. The winning prize of $1,000 went to the design by San Antonio architect James Riely Gordon (with partner D. Ernest Laub,) whose plans were probably chosen because of the commissioner's familiarity with him. In the following years, Gordon would go on to design courthouses across the state. 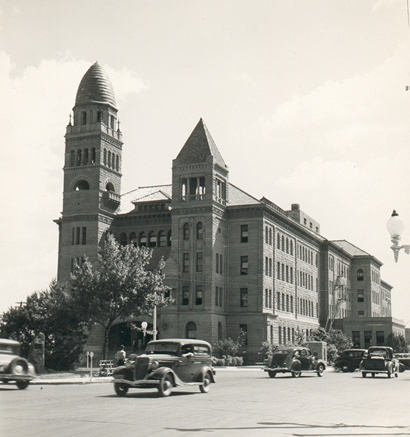 The contractors for the fourth Bexar County courthouse were George Dugan, Otto P. Kroeger and David Hughes. 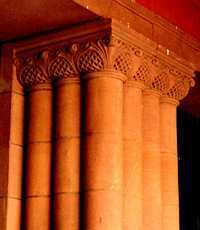 The monumental building is four stories tall with a basement and designed in Gordon's familiar Richardsonian Romanesque style with Spanish influences, built with Pecos red sandstone on top of a foundation of Burnet pink granite. Each corner of the courthouse contains a tower with the tower on the northeast corner being taller (134 feet) with a beehive dome with red tile while the other towers have pyramidal roofs with green tile. 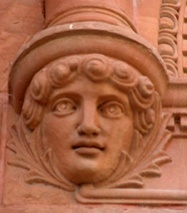 A carved eagle with a twelve foot wingspan adorns the face of the northwest tower just below the red terracotta foliated frieze that surrounds the building below the hipped roof. A thirty foot segmental arch buttressed by engaged towers with beehive domes preceded by a large granite staircase greets visitors at the north entrance. The entrance towers are interrupted on the second floor by a loggia of polished granite columns that enclose a balcony behind the double-height courtroom. Originally, the east side contained a U-shaped courtyard with a twenty-six foot fountain flanked by stairs of granite that led to a surrounding colonnade with granite balustrades and columns with intricate carved capitals. 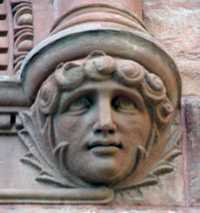 Other ornamental details include heavily bracketed balconies, arcaded windows separated by granite columns, hipped roof dormers, a bowed oriel on the northeast corner tower and carved faces at the east side entrance. The cornerstone for the courthouse was laid on December 17, 1892, but disagreements over workmanship quality, construction materials, plumbing, heating, electrical work, continuing changes in the plans and rising costs kept the courthouse from being completed until 1896, its $300,000 estimate soaring to a final $621,000. 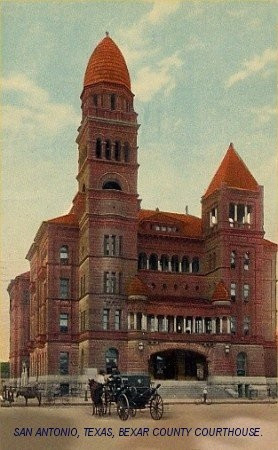 The courthouse served the county for almost twenty years before a five-story addition was built onto the south side entrance between 1914 and 1915 as designed by architects Leo M. J. Dielmann and Chalres T. Boelhauwe with the H. N. Jones Construction Company serving as contractor. 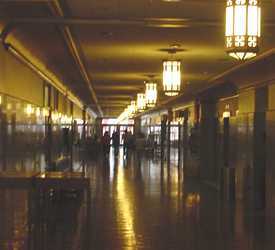 An even larger addition to the south side was built between 1926 and 1927, funded by $2,000,000 in revenue bonds, doubling the size of the original building. 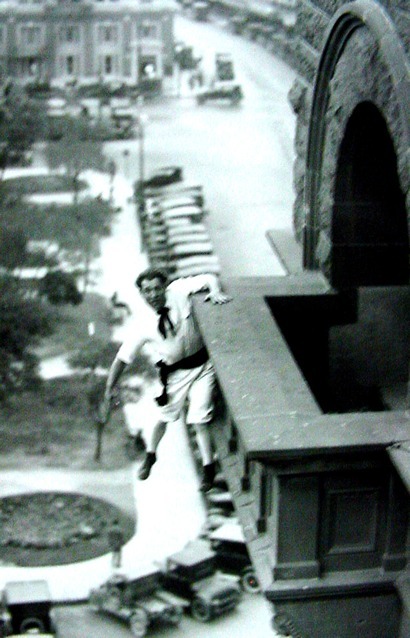 The architects were Phelps and Dewees, Emmet T. Jackson and George Willis with Walsh and Burney as the contractors. Like the 1914 addition, the 1926 addition utilized the same granite and sandstone as the original portion of the building and copied the intricate stonework. A fifth story was also added to the center of the building and the green roof tile was installed. Two extended wings were added to the west side and the east side courtyard was filled in, causing the fountain to be moved elsewhere. (See: Unveiling in San Antonio - Bronze Goes Green without Verdigris.) The interior of the building was also gutted at this time, the original steel beams and masonry arches replaced with reinforced concrete framing. Several modern remodels and additions were also made to the courthouse from the 1960s to the 1980s but were unsympathetic with the exterior building materials of the original courthouse. The most notable additions were the two-story 1963 addition over the west side entrance and the six-story 1972 addition onto the southwest corner of the building. 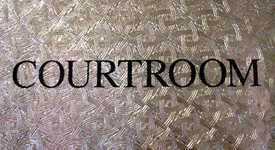 Both additions, designed by Edward R. Gondeck, consisted of windowless granite slabs that were uncomplimentary to the courthouses historic fabric. In 1967, the double height courtroom over the north side entrance was cut in half to create more offices and courtrooms. 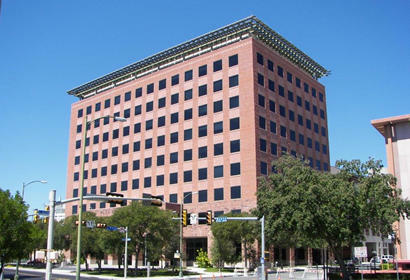 The creation of new district courts and the need for more office space finally resulted in the construction of the Cadena-Reeves Justice Center in 1988 on the west side of the 1890s courthouse, designed by architects Ford, Powell & Carson, Inc., Joneskell Architects, Inc., and Saldana & Associates, Inc. and constructed by the Gilbane Building Company. 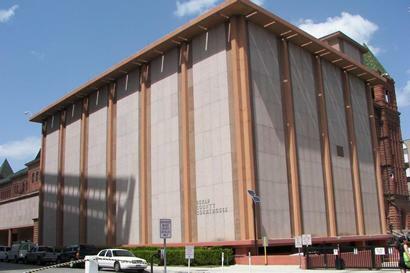 The Cadena-Reeves Justice Center subsequently became the home of the criminal courts while the old courthouse housed the civil courts. This was followed in 2010 by the building of the Paul Elizondo Tower to the rear of the Cadena-Reeves Justice Center, designed by Kell Mu�oz Architects, Inc. & Salda�a & Associates Architects and built by the Zachry Construction Corporation. 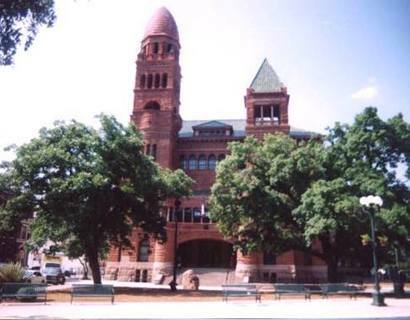 Starting with a master restoration plan that was adopted in 2000, funding from the Texas Historical Commission's Courthouse Preservation Program along with additional money from the Hidalgo Foundation and the county has allowed the 1890s courthouse to be restored to its 1920s condition. Work to clean and restore deteriorating exterior sandstone, granite and terracotta details along with repairing and replacing custom iron railings and investigating water seeping into the stone foundations was completed in 2003. 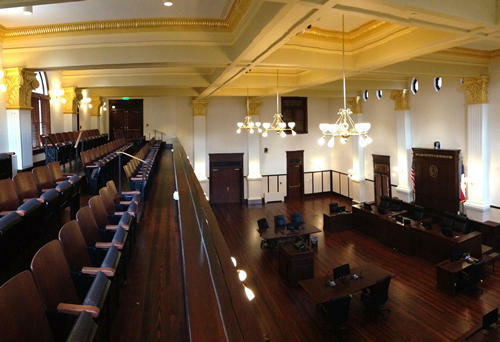 Interior restorations included the return of many of the buildings courtrooms to their 1927 appearance, and the return of the two-story courtroom over the north entrance to its 1896 appearance. 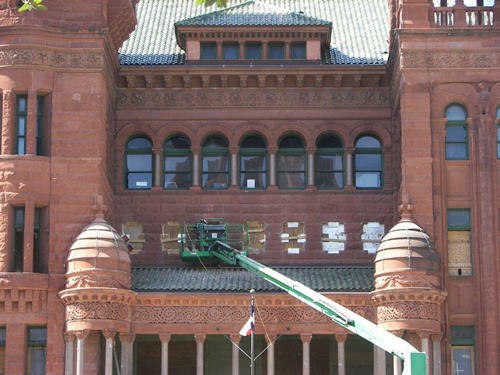 The removal of the modern Gondeck additions from the west side and southwest corner was completed in 2015, restoring the exterior stonework to its 1927 condition and a rededication of the courthouse was held on July 14, 2015. The cost of the fifteen year restoration effort was close to $35 million. 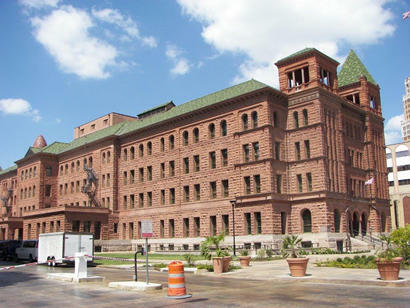 "'Grandeur' is restored at old courthouse" by John W. Gonzalez, San Antonio Express-News, July 15, 2015.
built just to the west of the 1892-96 courthouse in 1988.
behind the Cadena-Reeves Justice Center. This courthouse occupies the south side of Main Plaza, formerly called "La Plaza de las Islas", as originally laid out by the Canary Islanders in 1731. 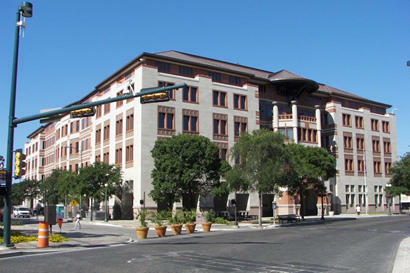 As it was then, this plaza is the administrative and judicial heart of Bexar County. This is the fourth edifice to house the government of the county since Texas entered the United States. 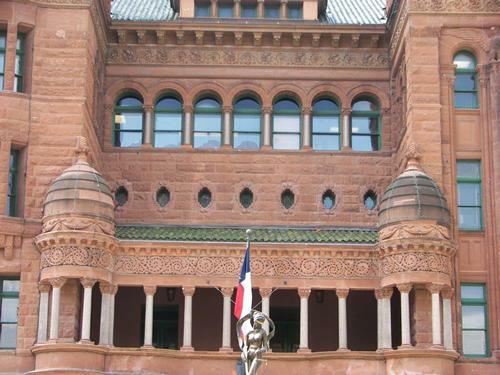 The citizens authorized $621,000 worth of bonds in the 1890s to finance its construction. James Riely Gordon (1863-1937), architect for many imposing public buildings, including at least one state capitol, submitted the award-winning Romanesque design for this courthouse. The builders were George Dugan, David Hughes, and Otto P. Kroeger. The foundation was laid in 1891, and the structure was completed in 1896. 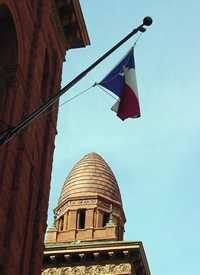 Native Texas granite and red sandstone are basic materials of the massive building. Towers roofed in green tile and red tile, handsome columns and arches, carvings, and many fine interior details gave the edifice great distinction. Additions in 1914 and 1926 continued the use of Texas granite and sandstone. Expansions in 1963, 1970, and 1973 employed other materials, however, and also altered portions of the original design. The exterior now looks the way it did in 1927. 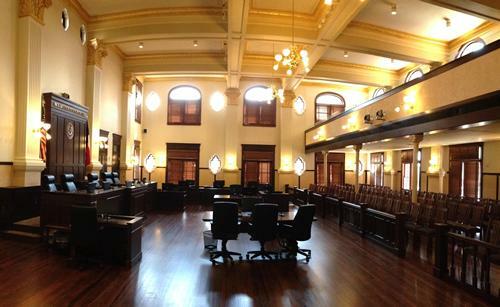 A restoration of the double height courtroom to its 1897 condition was completed in January, 2015. A rededication of the courthouse was held on July 14, 2015. Restoration underway of the "rose windows" in the double height courtroom over the front entrance. The courtroom windows after the restoration. 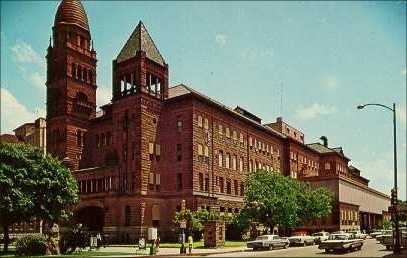 The 1972 Gondeck addition on the southwest corner of the courthouse. A portion of the 1963 Gondeck addition covering the west side entrance can be seen behind it. SW corner of the courthouse restored to its 1927 condition. 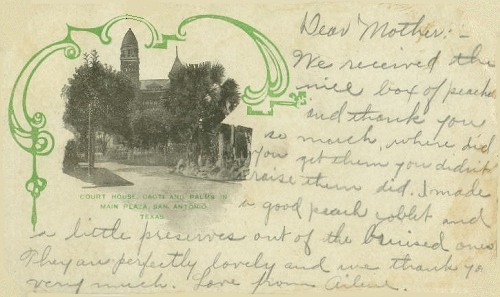 "A drawing of the 1882 Bexar County courthouse in a display case at the courthouse. The caption next to it said it was a drawing of the old courthouse, but didn't give a year, so I am assuming it is the 1882 courthouse. 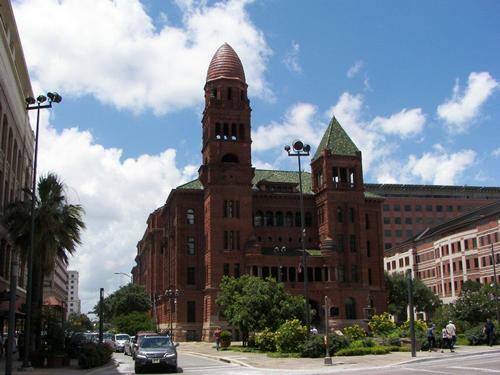 According to Sylvia Ann Santos of the Bexar County Historical Commission the 1882 courthouse was an Alfred Giles remodeling of the Masonic Building on Soledad Street."